Our talented team of highly skilled craftspeople can help transform your vision into a reality. With classic modern table designs from respected industrial designers Kaizo Oto and Ken Reinhard — not to mention our own creative in-house team — we avoid the trendy while focusing on the principles we value most: simplicity, elegance, and function. In today’s market you may find lesser products that look similar to ours. While our tables may cost more, you can be assured we place a premium on quality and longevity, which will save you money in the long run. Modular construction features interchangeable parts that can be refinished or replaced as needed, providing great long-term benefits for our clients. Whenever possible, we use this advantageous form of construction. 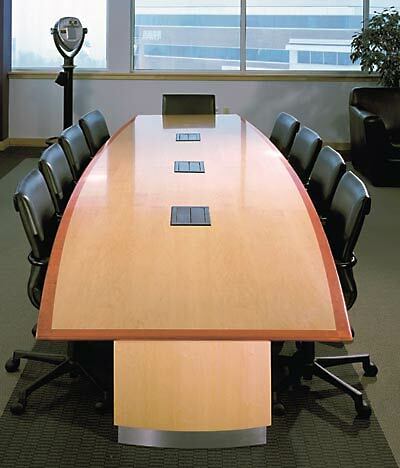 Balanced panel construction (which requires a more involved and expensive process) keeps table surfaces flat. Italian Catalyzed Polyurethane finish combines a remarkable look and feel with excellent abrasion resistance. It lasts far longer under stressful conditions than other widely used — and less expensive — materials (such as catalyzed lacquer and catalyzed varnish). We believe, however, that it is the best finish on the market — and we’ve made it our standard. Hand-glued edges create tight joints, making it difficult for liquids and dirt to infiltrate as gaps and glue lines are virtually nonexistent. A complete set of specifications accompanies each table we produce, allowing you to reorder matching products or request service quickly and easily.